> to have a tuft but does not look exactly like a tufted titmouse. > I spotted it 2-3 times in 2 days and then not again. I think the consensus on the bird was Tufted Titmouse, and I would have to agree, especially given the description of the crest and the length. One confusing factor on this photo is the bill, it appears too long for a parid or sparrow. However it was realized that this was due to a branch in the background obscuring the real outline. See also Chris Tessaglia-Hymes blow-up comparison with a Titmouse in a similar posture here. This was a very fun oddity that definitely had me perplexed for a while. 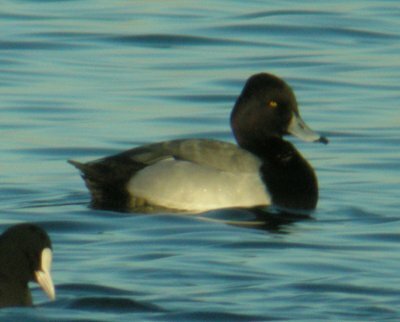 Now, for an intermission, with a hybrid Aythya in the UK from the chums at Punkbirder. The “Patagonia Picnic Table Effect” is a familiar concept to active birders. Extra scrutiny directed toward one rare bird often yields another, and the process sometimes plays out in several iterations. Pat Lindsay’s and my experiences yesterday took this theme to a comical extreme. We actually mentioned “the Effect” early in the morning, when we found a Chat while twitching a previously reported Cattle Egret in Water Mill. Although a Chat is always very nice, I’m starting to wonder whether the egret was perhaps too obliging. Ditto for the Whistling Swans in Easthampton—but not for the Barnacle Goose in Montauk. This bird evaded our efforts to find it long enough to prompt a goose by goose examination of the entire neighborhood. During this search, my binoculars fell upon a Pink-footed Goose. This was of course very exciting, but the goose promptly disappeared from view, intensifying our excitement in a rather unpleasant way. While trying to relocate the Pink-foot, Pat found a Western-type Kingbird, which also immediately disappeared. This engendered even more unpleasant excitement, as we were intensely aware that we needed to rule out Cassin’s Kingbird, an example of which had been present recently just a couple of miles from where we were standing. A forced march to find additional vantages ensued. From the very most remote of these, I scoped the pasture and found an Ash-throated Flycatcher! Beyond anything resembling composure, I am reported to have said, “Pat, it would be very improbable to find an Ash-throat and a Western Kingbird at the same place and the same time.” (For the record, she did not waver and ultimately was the first to re-find and positively identify the Western Kingbird.) It goes without saying that the Ash-throat promptly disappeared also, prompting a forced retreat back to our original vantages. Shell-shocked, oxygen-deprived, and over-heated, I called in reinforcements. Gail Benson and Hugh McGuinness were relatively merciful in the sport they later made of these calls. It helped that all three birds cooperated. We eventually saw the Barnacle Goose, too, but it seems fortunate that we had such difficulty doing so at first. Some of my photos are posted at http://picasaweb.google.com/tixbirdz, but other people obtained much better pictures. As of today at Montauk, there is a Pink-footed Goose, a Barnacle Goose, a wiley Ash-throated Flycatcher, and TWO Western Kingbirds. Some of Mike Andersen's pictures from the day are here.